Publicity Lyrics by Guri is latest Punjabi song sung by Guri. Lyrics of song Publicity has been penned by Jung Sandhu. Music of song Publicity has been composed by Dj Flow. 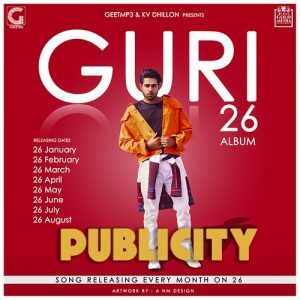 This is Guri’s First song of his upcoming Debut album 26 by Guri. Song Publicity by Guri will be released on 26th January under the Label of Geetmp3.